Cats, now the most popular pet in Europe and North America, were once described as asocial animals, but this is no longer regarded as true. Although very different from dogs, cats also need human interaction and most importantly, your loving attention. Keeping your cat indoors or allowing them outdoors? When you bring a new kitten or cat into your home you’ll have to decide whether he or she will live strictly indoors or will be allowed outside. There are advantages and disadvantages in both cases. 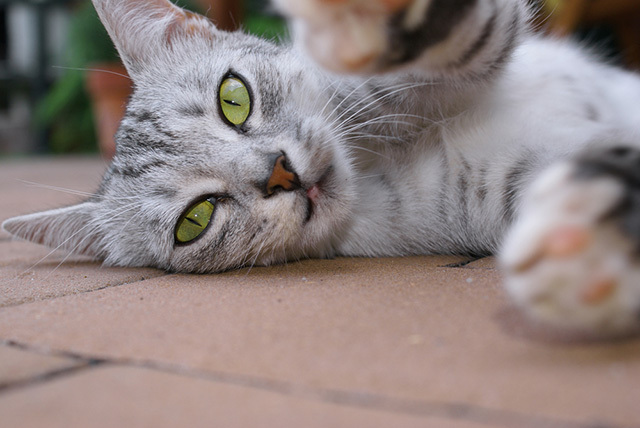 Free-roaming cats are prone to more illnesses and have a much shorter life expectancy, as they can be hit by cars, attacked by other animals and exposed to internal and external parasites such as fleas, worms and ear mites. Conversely, if your cat never ventures outside you must provide him or her with physical and mental stimulation, including interaction with you, exercise, scratching posts and a clean toilet area. Whatever decision you make, following a few simple guidelines to direct your cat’s behaviour can ensure that harmony reigns in your cat-loving household. Scratching just comes naturally to cats. 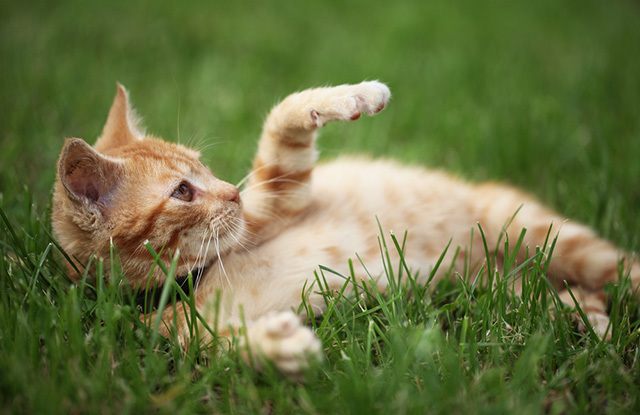 An instinctive activity that begins when kittens are five weeks old, scratching allows cats to leave chemical and visual signals that, among other functions, serve as ‘messages’ to other cats and animals. However, what’s entirely normal for your cat can become a big problem for you if he or she starts scratching your carpets and furniture. If this happens, you can cover or remove the tempting objects, however it’s quite likely that an alternative place to scratch will be found. An easier, more practical solution is to provide your cat with a special scratching place, usually a post, of his/her own. Don’t be surprised if find that your kitten or cat may be slightly picky about what kind of scratching post he or she will agree to use. Not all commercially available scratching posts are equally attractive to all cats. Posts that some cats might find acceptable have sisal, cardboard, wood or wood composite surfaces. Some cat owners have found that making their own posts, whether from soft logs, tree stumps or a plank of wood covered in material with a longitudinal weave does the trick. The most important characteristics of a post are that it be taller than the cat standing on hind legs, sturdy enough not to tip over and located in a prominent, easily accessible area. A board about 15-20 cm wide by 30-35 cm long attached to a wall can also work well. 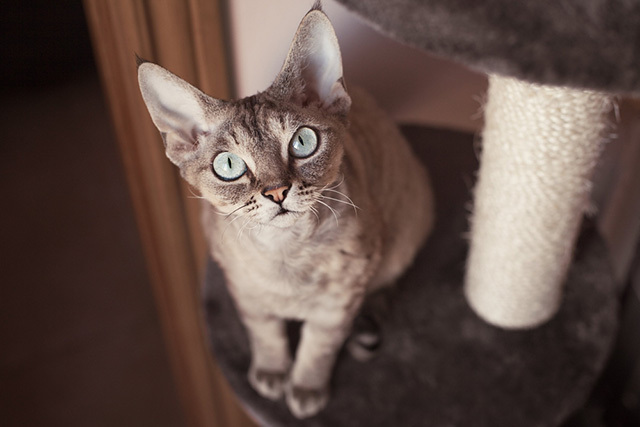 Whatever its construction, the scratching post or board should not be changed as long as your cat is still using it. The more scratched and awful looking, the more your cat will love and use it – instead of your furniture. What do cats like to play with? Make sure your kitten or cat has lots of opportunities for interesting, challenging play that will satisfy natural instincts and provide much-needed activity. Find toys that bounce or flutter – there are many available – that they can pretend to “chase”, “hunt” and “capture”. Some cats love to chase moving spots of light, whether they’re produced by mirrors or flashlights. A ping-pong ball in a tissue box is one good easy to make toy. You can also attach a ball of aluminium foil to a long string and tie it to your belt or waist. As you move about, your cat will have a great time interacting with you while trying to “catch” the ball. Just be sure to make the string long enough that kitty doesn’t accidentally catch your leg! You should try to have at least one daily, 15-minute interactive play session with your cat, especially if he or she is often left alone. Cats are fastidious creatures, so if your cat needs to attend to toileting indoors, providing your cat with a clean, easily accessible toilet area will help minimise any litter problems. Cats generally prefer unscented, soft-textured fine litter. Some cats like to urinate in one box and defecate in another so the ideal number of litter boxes is one box per cat plus one. Therefore, a two-cat household should have three litter boxes placed on different floors or in different rooms. Don’t put litter boxes next to noisy equipment such as boilers or washing machines – cats prefer the quiet. Scoop out faecal matter (and urine if you use a clumping litter) daily. Wash boxes with water and mild detergent once a week if you use non-clumping litter or once a month if you use the clumping type. Going to the toilet outside the box can occur for several different reasons, various medical conditions being the most common. If you suspect your cat might have such a problem, consult your veterinary surgeon for a diagnosis and appropriate treatment. Why do cats mark their territory? Spraying, or urine marking, is a normal behaviour in both cats with intact sexual organs, as well as in neutered cats. In fact, as many as ten per cent of castrated male and five per cent of spayed female adult cats spray regularly. Spraying is often associated with the presence of other cats (both inside and outside the home) or other stresses, such as changes in the cat’s environment, (a new roommate, pet or baby, or perhaps a change in the amount of time the cat is left alone), that can cause anxiety. Spraying may be the way your cat communicates anxiety. Treatment is available for spraying – just ask your vet for advice.